Many, many years ago, Alan Garner visited Melbourne. With a handful of classmates, I was lucky enough to be taken to The Little Bookroom to meet him. He was the first author I'd ever seen in the flesh and I was completely dumbstruck with awe. My friend Fiona, braver than I, asked the great man if he believed in 'a God, no God, or gods plural.' How I wished I'd had the courage to ask such a good question! He was diffident and modest, and shocked us by saying that when he'd got stuck at one point in the story, he'd written, 'Then the children ran away home and lived happily ever after.' I didn't realise then that authors, those inspired superhuman creatures, could get stuck, or despair, or choose the ridiculous as a means of escape from a tight corner. Cut to nearly forty years later and I discover this book, misfiled on the children's book shelves in Berkelouw in Oxford St. I didn't even know it existed -- what a find! Boneland is the final part of a trilogy that began over fifty years ago with The Weirdstone of Brisingamen and The Moon of Gomrath. I tried to re-read Weirdstone a few years ago and recoiled in dismay from the elves-and-pixies-and-wicked-witches vibe; I can't really even remember the story. Some readers who loved Weirdstone and Gomrath have likewise recoiled from this mature, dense, dark conclusion of the trilogy. I say again: Boneland is not a children's book. Boneland finds Colin, one of the two child protagonists of the earlier books, adult and damaged, condemned to forget (everything that happened before he was thirteen) and to remember (in eidetic detail, everything that's happened to him since). He's searching for his missing sister, which is perhaps a way of making himself whole. Meg, his psychiatrist, is helping him with his quest, but she may not be all she seems. Interwoven with Colin's story is that of an isolated, prehistoric shaman, who fears his ritual responsibilities will die with him, and thus spell the end of the world. He is also searching for a woman, this time to make a child to inherit his sacred knowledge. His prayers are answered, but not in the way he expects. If I hadn't discovered the Guardian's reading group discussion of Boneland, I would have struggled to catch about nine tenths of the references and resonances in this slim but densely packed novel. With the aid of Google maps, I can trace the geography of Colin's home on Alderley Edge in Cheshire, the site of most of Garner's work. With the help of the internet, I can interpret the poetic allusions, the echoes of medieval legend, and the callbacks to the earlier novels. Is this a flaw? Should I be able to read the novel simply, on its own terms, without help? I would argue not. 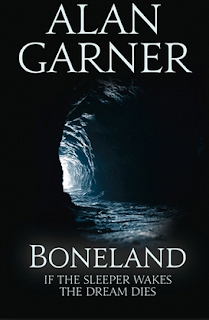 With the help of the learned Guardian readers, sharing their expertise in local archaeology, herbs, Gawain and the Green Knight, particle physics, astronomy, the threefold goddess, and much more, the experience of reading Boneland becomes infinitely deepened and enriched. I first read most of the book fast, on the plane on the way home. I'm now reading it again, more slowly, line by line, stopping to check references and consult maps. Both ways of reading have been exhilarating in their own way. Alan Garner is the writer I admire and revere above all others, in his spare, scalpel-sharp style (next door to reading poetry in prose), in his wise, dense, important subject matter, in his light-footed wit and humour. There is no other writer like him; his books can be hard work, but my god, they are so rewarding. He has said that Boneland may be his last novel. I hope it isn't, but if it proves to be, it would be a worthy farewell. I found myself in Sydney last weekend (happy birthday, Bridget!) and because we were flying Jetstar and had to watch our luggage weight, I only risked taking one book with me. Who was I kidding? Of course one book was nowhere near enough. So a rummage through local secondhand bookshops was in order! First stop was Gould's Book Arcade in Newtown, a glorious warehouse-sized conglomeration of books, records, CDs and magazines. Only two of the hundred or so bookshelves was devoted to children's books, but I still found several titles to tempt me. The one I bought was the second volume of Hilary McKay's Casson series, Indigo's Star, which I hadn't succeeded in finding anywhere -- it's gone from our library, and this is the first time I've found it secondhand. This filled in a few gaps for me -- I found out who Tom was, and why Rose loved him, where Indigo got his guitar, and more about the gradual disengagement of Bill from his family (which I must say his wife Eve seems to accept with almost supernatural placidity). Indigo is being bullied at school, while Tom has fled from his father's new family. Stars, music, high places and Rose's drawing combine for a bittersweet ending. I've read the Casson books all out of order, and I'm not sure even now which ones I've missed, because some of them have similar names (Permanent Rose, Forever Rose, Caddy Ever After, Caddy's World) which is quite inconsiderate of Hilary McKay. Also they weren't even written in sequential order, which makes sorting out events even tougher! Personally, I enjoy the warm, loving muddle of the Casson family. But Diana Wynne Jones wrote a rather scathing review of Permanent Rose where she classifies the family's dysfunction as more desperate, insecure and actually quite threatening to the well-being of the children. It's a fine line. I gobbled down this book like a handful of lollies (though it's actually much more nourishing than that). At first I had reservations because it was very American-focused, but it turns out I seem to have read most of the important works of American children's literature anyway. Yay for me. Bruce Handy, who writes for Vanity Fair, is the most delightful reading companion, confessing his personal blind spots and passions with engaging flair. 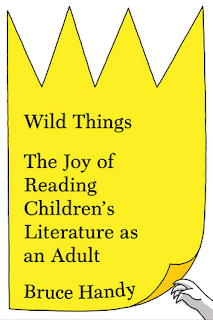 He has structured Wild Things in roughly reading order, from the infant picture book Goodnight Moon (one book I have never read!) through the works of Maurice Sendak and Dr Suess, through Narnia and The Wizard of Oz, right up to the 'girly' books he never read as a child (Little Women, Little House on the Prairie), finishing with books about death and the masterpiece that is Charlotte's Web. This book was so much fun to read, but also thoughtful and sometimes argumentative. I loved that Handy (like me) admires rather than 'gets' Maurice Sendak; also that (very much unlike me) he only got thirty pages into Anne of Green Gables before throwing the book across the room! He fell in love with the Narnia books, then felt betrayed when he discovered their Christian agenda. He had only intended to read the first Little House book, but found himself eagerly devouring all nine in the series. However, he is not uncritical, and suggests Louise Erdrich's The Birchbark House series for a corrective Native American perspective (a suggestion I intend to take up as soon as I can). The book ends with a list of other intriguing 'book pairs' for further reading, and a comprehensive bibliography. Pure pleasure. Anyone who has followed this blog for a while will know how much I adore and admire Rumer Godden's writing. So you can imagine my delight when I discover a novel of hers that I haven't read yet. Alas, Pippa Passes (after a poem by Browning) is not one of Godden's masterpieces. Shy, naive Pippa has come to magical Venice as a member of the company's corps de ballet. They are only staying for a fortnight, but what a crowded two weeks for Pippa, who is disgraced, promoted, wooed, falls in love, almost raped, adopted by the aristocracy and finds she can choose between two vocations, dancing or singing! 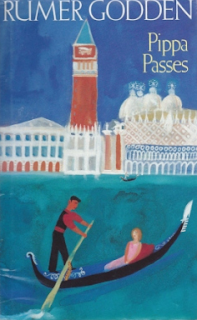 The descriptions of Venice are gorgeous, though they felt dated to me, even though the novel was published in 1994, four years after my last visit (that is so sad). Pippa's marvelling at Italian panini and tiramisu, her timid reserve, her shocked response to a lesbian advance, all felt more like a fifties novel than one set in the 1990s. And yes, sadly, there is a wicked lesbian character who can't be trusted to be around young girls ever again -- I groaned, which is not something I often do when reading Rumer Godden! I'll keep it in my collection as a hymn to Venice, but this one is not going to be a favourite. Bletchley Park was the centre of Britain's wartime code-breaking -- a country house filled with mysterious machines (the foreruners of today's computers), boffins and hundreds of efficient service women who tended the machines and sorted the coded messages, all wrapped in an impenetrable cloak of absolute secrecy. It wasn't until the 1970s that details of Bletchley's activities began to emerge. 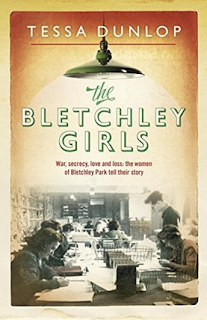 The Bletchley Girls collects the reminiscences of fifteen surviving women who worked at Bletchley Park. Now in their nineties, they recall their various experiences living and working at BP. For some, it was the defining period of their lives; for others, a mere blip in a long and interesting career. Everyone's Bletchley was different. Some found it friendly and relaxed, others intimidating or dull. So my World War II binge has ended on a rather anti-climactic note, I'm afraid. I seem to be in the middle of a World War II binge -- partly because of the Convent book group theme, partly because I went to see Dunkirk recently (which was excellent by the way). I pounced on Jambusters when I saw it pop up on Brotherhood Books (yes, I'm now checking it daily, don't judge me). This book by Julie Summers inspired the development of the TV series Home Fires, which Michael and I loved. 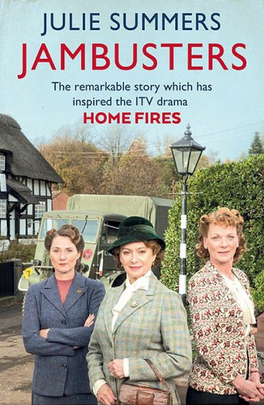 We were extremely cross that ITV cancelled it after only two seasons, and on a massive cliffhanger, too. But that is a topic for another day! Jambusters is the story of Women's Institutes during the Second World War. Though it was a voluntary and notionally pacifist organisation, its immense reach and breadth meant that it became the focus of many home front activities, from welcoming and housing evacuees, to making millions of jars of jam to prevent food wastage, to knitting garments for servicemen, even doing laundry and mending for local battalions. Salvage, growing vegetables, making toys, skinning rabbits -- all this on top of the usual work of caring for the family and often running a farm or business, with the men absent, as well as keeping up morale by running village entertainments like dances and choirs -- and enduring the terrors and privations of war with a calm and cheerful demeanour! I came away from this book breathless at the sheer amount of work (all unpaid, mind you) that these incredible women were expected to shoulder. And many rural women were living in housing without electricity or even running water! Bloody hell. I can tell you, I was counting my blessings after this one. Full of wonderful details of daily life in war time, this would make a fantastic research resource. And it highlights the value of friendship and community which was the silver lining to all the suffering that they endured in six long years of war. PS I forgot to say that I was particularly intrigued to discover that one of the founders and stalwarts of the WI was a woman called Grace Hadow, who came from the Gloucestershire village where my aunt lives, South Cerney. My aunt tells me that the Cirencester branch of the WI that Hadow founded was unique in being based in a town rather than a village. And my grandmother was secretary of the WI in Crudwell for many years. No wonder I enjoyed this book so much! It's in me blood. I couldn't find an image of the edition I bought from Brotherhood Books, which has a 20th anniversary sticker on it. 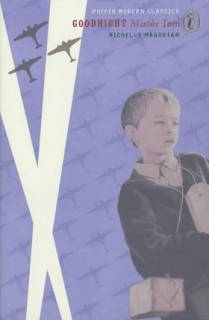 I'd never read Michelle Magorian's Goodnight Mister Tom, first published in 1981. But when it was mentioned at my ladies' book group, and they all in unison sighed and smiled, I knew it would be a winner. Reading this book was like sinking into a comfortable old armchair. In some ways, it's an old-fashioned odd couple story: A shy evacuee is billeted with a crusty old countryman, and as their friendship deepens and young Will settles into the community, he discovers gifts and strengths he never knew he had. So far, so predictable. But in other ways, this is quite a dark and disturbing tale. The background is the outbreak of World War II, with bombing raids and the threat of invasion in the air. More troubling is the character of Will's abusive, mentally ill mother. The severe abuse Will suffers at her hands is balanced by sunny excursions to the woods and the scenes of childhood friendship (though this too is touched by darkness). I have previously read Magorian's later novel, Back Home, and there were shared themes with Goodnight Mister Tom -- the wartime setting, the saving power of art, an abused or neglected child, even the charms of an isolated cottage in the woods, are common to both books. I also really like the unconventional minor characters, who could so easily have been stereotyped figures -- like the trouser-wearing, smoking doctor's wife, or colourful Zach, the flamboyant child of theatrical parents. I first read Art Spiegelman's Maus a year ago, by accident, because I mistakenly thought we were doing it for book group. Finally, we are actually officially doing it as part of our Jewish Experience theme, so I got to read it again. It was just as good the second time around: punchy, powerful, pacy. The inexorable slide from prejudice to genocide is just as terrifying, and Vladek's refusal to surrender, his determination to survive, is astounding. This time I noticed more of the details of Vladek's story, the twists and turns along the way: a betrayal here, a bargain there, friends who appear and disappear, acquaintances who inexplicably manage to survive, relatives who are equally inexplicably slaughtered. Alice had to read this for school and though she is not usually a fan of graphic novels (she finds them confusing and distracting to read), she thought Maus was great. It packs a hell of a wallop into an easily digestible package. A modern classic.